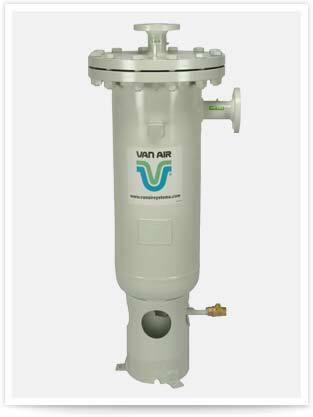 Van Air Systems Mist Eliminators are special purpose coalescing filters for removing large volumes of oil. In addition, it removes oil aerosols with a pressure drop of 1 psid or less. The Mist Eliminator minimizes pressure drops, translates directly to energy savings. With a thick bed of glass fiber, the Mist Eliminator element facilitates self-cleaning by continuous draining. Contaminants are trapped at various stages within the fiber bed, not only at the surface. This prevents clogging and keeps pressure drop low.